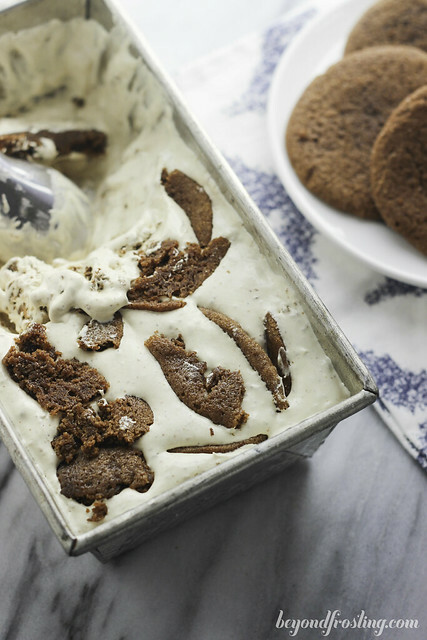 A no-churn ice cream with molasses flavor and loaded with soft-baked molasses (gingerbread) cookies. 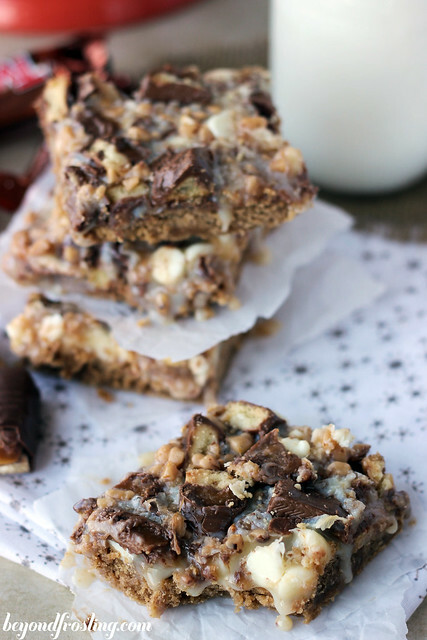 Errr it’s one last holiday recipe for you! I decided not to squeeze in a peppermint recipe, so we will just celebrate Christmas in July. 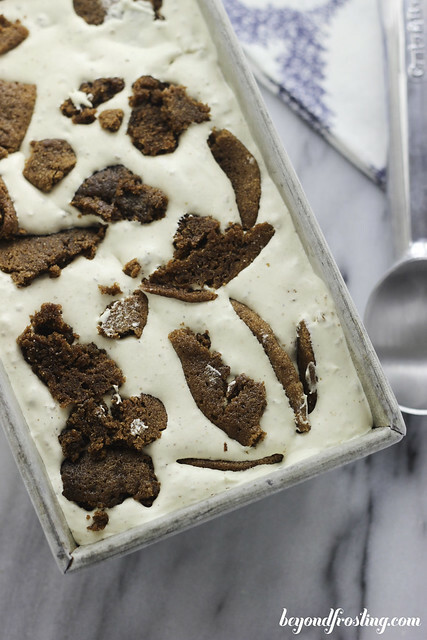 This No-Churn Molasses Cookie Ice Cream I just could not wait to share with you. 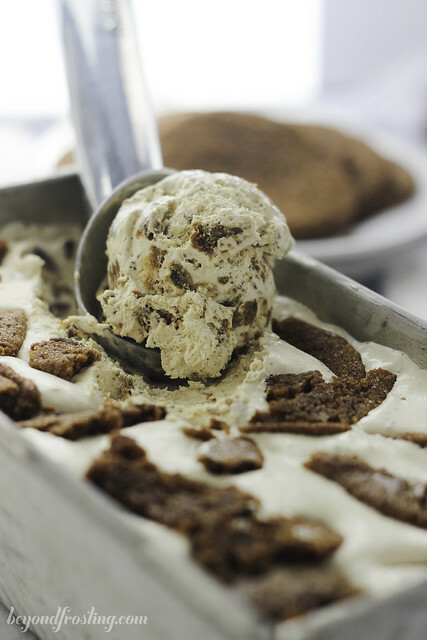 I am in love with this ice cream because it reminds me of my favorite Ben and Jerry’s pint; Oatmeal Cookie. You wanna know the best part of this ice cream? Well there are a few things. First, it is LOADED with soft-baked molasses cookies. 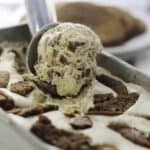 It’s also no-churn, which means you can throw all the ingredients together in a mixer and in about five minutes, the batter is ready to freeze. I am not quite sure if you have leftover gingerbread (or molasses) cookies, but if you do, this is the perfect excuse to make this ice cream! The thing is, your cookies need to be really soft, none of those hard gingerbread men. Why? Because that’s what makes this ice cream so awesome. Did I mention it is loaded with cookies? 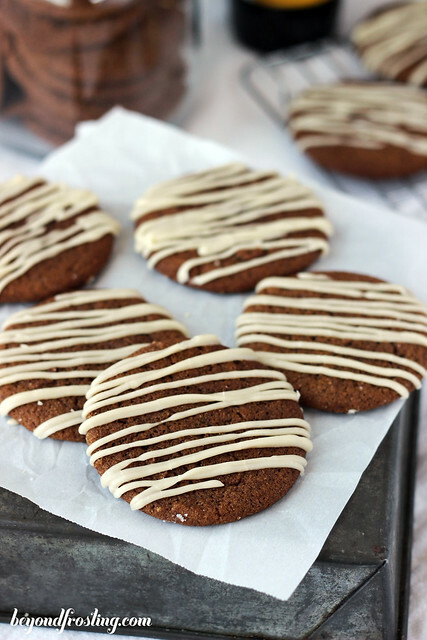 If you don’t have any extra cookies left, you can make a batch of my soft-baked molasses cookies, just leave off the brown butter glaze. 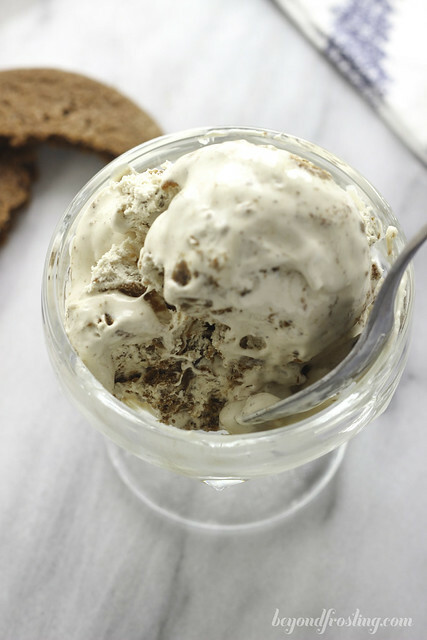 I suppose if you did have hard gingerbread cookies, you could grind them up in a food processor and then add them to this ice cream. It would still be good I’m sure! Over the summer, I went crazy for ice cream! It’s been awhile since I shared a recipe with you. Although I do love my KitchenAid Ice Cream Maker , there is nothing quite like a no-churn ice cream. It’s always on the soft side, which is the way I prefer my ice cream! You might also need a storage container. I found the perfect Ice Cream Container , this summer, which holds about 6 cups of ice cream. You can also use a metal loaf pan like the one in my pictures, and just cover it with aluminum foil. 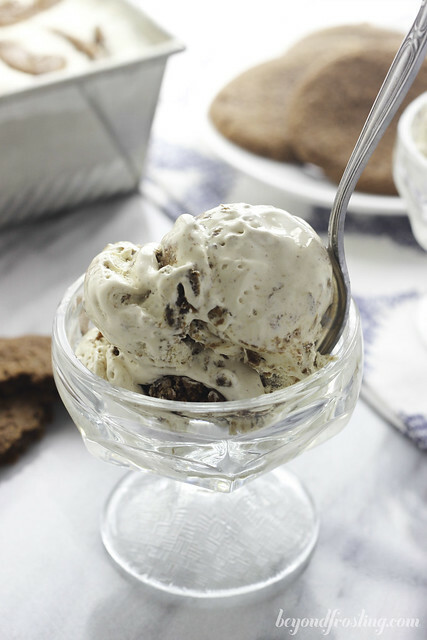 This ice cream is a tad on the sweet side, so you should add one tablespoon of molasses at a time, and taste the batter first! Don’t forget to save some extra cookies to put on top, strictly cosmetic of course. On medium speed, beat Cool Whip, sweetened condensed milk, molasses, cinnamon and cloves until completely smooth; about 3 minutes. Break up cookies into smaller pieces and slowly add to batter as it is still mixing. 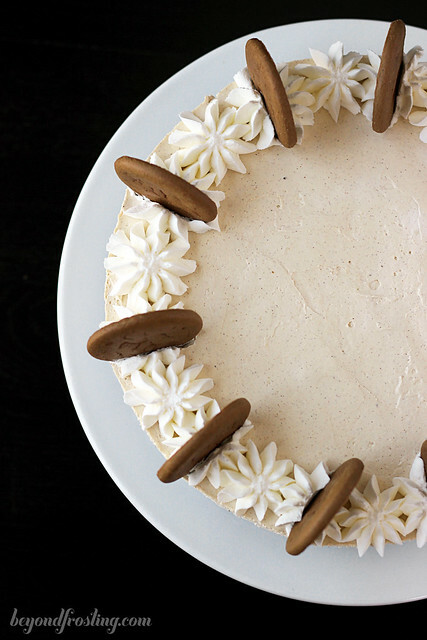 Reserve some cookies to put on the top of the batter. 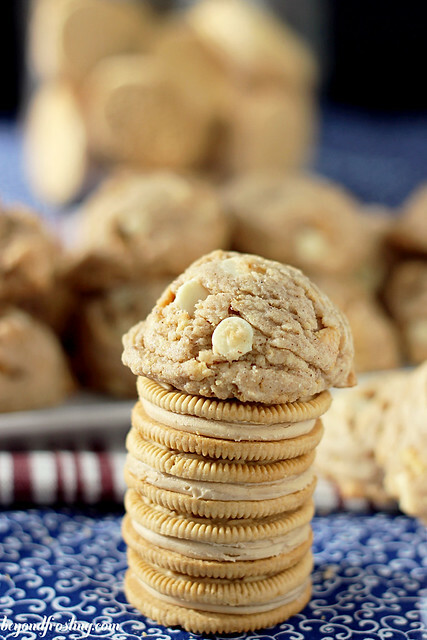 Pour mixture into a freezer-safe container and sprinkle with additional cookies on top. Oh my word, this look absolutely divine!! What a combination and I love that it’s no-churn too! This sounds like it’ll be my new favorite ice cream! Yum! Julianne, ok dude, you had me at “LOADED with soft-baked molasses cookies” and that first photo. Whoa. . and now I want ice cream at midnight. . yummmm!!! love! 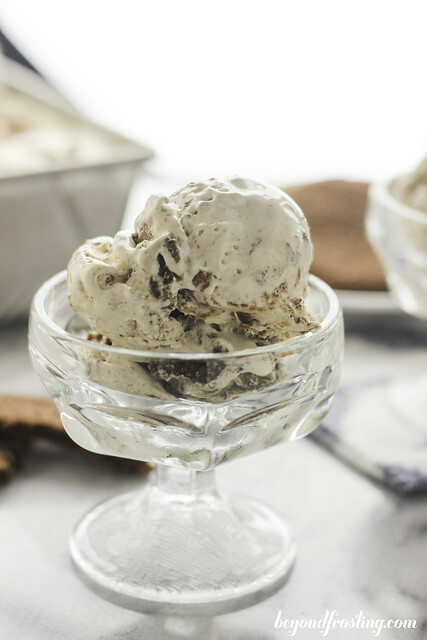 I love making no churn ice cream because like you, I love the soft stuff! I am also a huge gingerbread fan so this is perfect for me! Wowza this looks beyond fantastic. I love ice cream all year. Pinned. 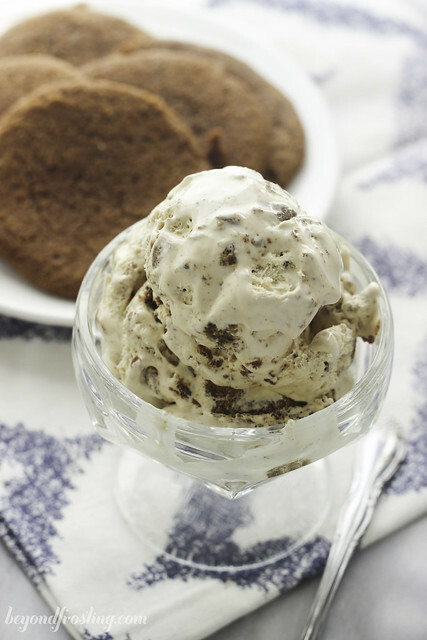 Ice cream with freshly baked cookies inside is what makes life happy! This is a fantastic flavor, too!